Greenwich High School diver Emily Stotesbery in action during girls high school swimming between Greenwich High School and Staples High School at Greenwich High School, Wednesday, Oct. 19, 2011. Not all losses are bad defeats -- especially when the opponent is out of most team's leagues. That was the case for the Staples girls swimming team in its 104-74 loss at Greenwich. Greenwich has been the top team in the state and raised its record to 7-0. Staples dropped to 2-4. Although the Lady Wreckers fell short on the scoreboard, they felt good about the meet because, they raced well and had 12 state-qualifying performances. "There were some good races and we're on the right track," Staples coach Mike Laux said. "Greenwich is one of the 20 best teams in the country." The Lady Wreckers actually won a race with sophomore Verity Abel triumphing in the 500-yard freestyle with a time of 5:20.26. Junior Sarah Cooperman took third in the 500-free (5:36.63) and qualified for states. Abel took second in the 200-yard freestyle (1:59.24) and Cooperman was fifth in the 200-free (2:10.47). Sophomore Gabby LeBlanc placed second in the 100-yard breaststroke (1:15.02). Freshman Jessi Taets was fifth in the 100-breaststroke (1:17.28). Senior captain Gabby Wimer (26.37) and junior Rebecca Raab (27.43) were third and fifth, respectively in the 50-yard freestyle. Freshman Stacy Kaneko qualified for states in the 100-yard backstroke (1:07.55) and placed third. Junior Alexis Teixeira was fifth in the 100-back (1:08.90) and punched in her state ticket as well. The Lady Cardinals won all three relays. Staples took second in the 200-yard freestyle relay (1:47.43) behind Wimer, Taets, Raab and Abel and in the 400-yard freestyle relay (3:53.76) with Wimer, Cooperman, Kaneko and Abel powering the way. Greenwich took the top two spots in the 200-yard medley relay. Kaneko, Taets, senior captain Caroline Valerio and Rabb led the Lady Wreckers to third in the 200-medley relay (2:01.30). Overall, the Lady Cardinals swept four events, the 200-yard individual medley, diving, diving, 100-yard butterfly and the 100-yard freestyle. Junior Patricia Maragos (2:34.38) and Teixiera (2:36.94) were four-five in the 200-IM. 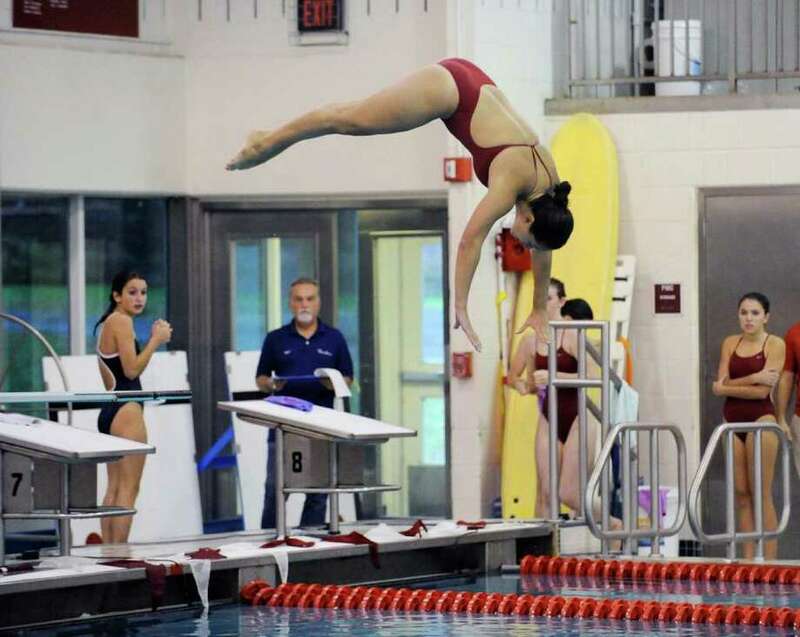 Although they were swept in diving, senior captain Michelle Mastrianni (184.75), freshman Olivia Crosby (167.70) and sophomore Anna Violette (164) all qualified for states and finished fourth, fifth and sixth, respectively. Valerio (1:05.92) and LeBlanc (1:11.36) were four-five in the 100-fly while Wimer (57.57) and freshman Jordan Santarella (1:09.26) were four-five in the 100-free. "The girls improved today [Wednesday] and they are getting ready for the meet of the season," said Laux, who is referring to today's home meet with Westhill in a contest that could go either way. "It was a good meet [against Greenwich]."